Watch The Hollow: Restless spirits stir this Hollow's Eve, beckoning Ian Cranston, the last blood relative of Ichabod Crane, back to Sleepy Hollow. Thundering hooves unleash a wave of bone-chilling screams as the ghost of the Headless Horseman rides again! Ian must try to save the town and his girlfriend, Karen and determine whether the sword-wielding stalker is their clownish classmate, Brody in costume, or the dark rider himself. 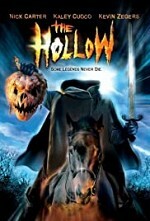 If it's truly the Headless Horseman... how do you kill what's already dead?